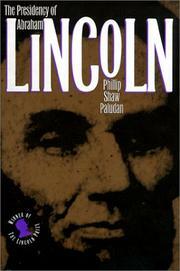  In this narrative history of the Great Emancipator's administration, Paludan (History/Kansas; Victims, 1988) skillfully delineates the great accomplishments and salient shortcomings of Lincoln and the government he led. In contrast to historians who have argued that Lincoln intended initially only to save the Union and stop the spread of slavery to the territories, deciding to end slavery in the southern states only gradually and as a war tactic, Paludan contends that ``freeing the slaves and saving the Union were linked as one goal, not two optional goals.'' The author finds Lincoln's greatness both in his devotion to the constitutional system and in his fluent appeal to the American people to believe in their institutions enough to make war on their behalf. The bulk of Paludan's narrative retraces the military history of the Civil War from the vantage point of the White House, showing Lincoln's single-minded unity of political purpose and revealing the blunders of leadership that were often those of commanders Lincoln appointed, but that in some cases were Lincoln's own--a decision to detach 35,000 men from McClellan's army on the eve of the Seven Days battles out of anxiety for the fate of Washington, D.C., for instance. Throughout, however, Lincoln showed greatness by successfully mobilizing the resources of the nation for war and by waging that war on a scale greater than any other in history, while eloquently articulating a vision of popular government for a society free of slavery at last. Paludan renders not the heroic Lincoln of myth, but the flesh- and-bone prairie lawyer who, improbably, both saved the Union and ended a monstrous evil by appealing to the better angels of America's nature. A significant achievement in Lincoln scholarship.